Napoleon Publishing: lian goodall on the move! lian goodall on the move! Author lian goodall has been pretty busy. 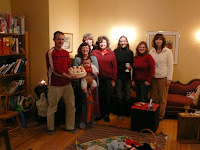 Her Fall 2007 "Creative Writing/Children's Book" course wound up with a get together. It was a great group and lian looks forward to teaching the same course in January in Newmarket for the York Region District School Board Continuing Education, as well as a new course called "Writing the Past." Wednesday, December 5th lian goodall gave a presentation from her book, Portia White: Singing Towards the Future to Dale Matsushige's Choral Music class and some Writers' Craft students at Sir William Mullock High School. 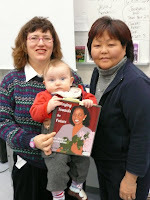 Shown in the photo are lian, her baby son Amzie and the wonderful music teacher Ms. Matsushige. 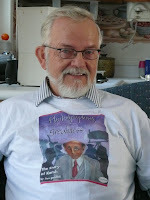 lian goodall's new book, Photographing Greatness: the Story of Karsh, is about to be launched and lian's dad is ready! The first book signing will take place at Roxanne's Reflections on St. Andrew Street in Fergus from 1 pm to 2:30 pm on Saturday, December 8, 2007. Free cake will be available in honour of Mr. Karsh's birthday month. lian will be signing at Nicholas Hoare on Sussex Drive in Ottawa on Sunday, December 16, 2007 from 2 to 3 pm. The book is dedicated to lian's father. Posted by Napoleon & Company at 1:17 p.m.